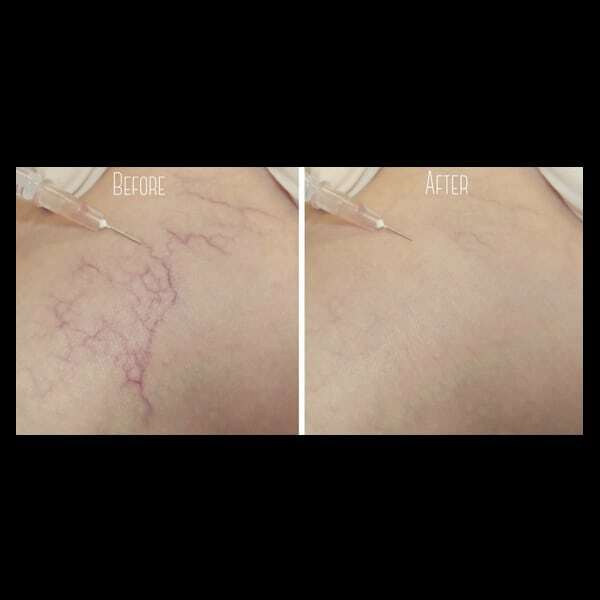 Also known as: spider vein treatment, leg vein treatment, vein removal, thread vein treatment, vein injections, saline vein injections and varicose vein injections. With the support of her dedicated team, Dr Joanna Teh provides leg vein treatments to clients from across Perth. Her care and experience means you will feel comfortable throughout your treatment experience. While individual results may vary, you can rest assured your treatment will be completely safe and highly professional. Non-invasive leg vein treatments can be administered with minimal discomfort. The treatment works to reduce the size of the vein, diminishing its appearance under the skin. You will experience little downtime and be able to see results very quickly. Unsightly leg veins can affect your self-esteem and leave you feeling as though you can’t enjoy wearing shorts and skirts. Book treatment with Dermedica and you can look forward to enjoying summer again! Say goodbye to spider veins with a simple treatment plan from Dermedica. Dr Teh uses a micro needle to gentle administer a medication to shrink leg veins. It is non invasive with no downtime. What are spider veins or small varicose veins? What causes leg veins or spider veins on your legs? Is there any downtime with sclerotherapy? Are there exercise and activity restrictions before and after leg vein treatment? Are there any side effects with sclerotherapy? How long before I notice results with sclerotherapy, and how long do they last? How long is each session of sclerotherapy, and how many sclerotherapy treatments do I need? Why choose Dermedica for your sclerotherapy? Spider veins or ‘telangiectasias’ are small thin blood vessels that lie close to the surface of the skin and appear red or blue. These small, enlarged blood vessels may be short, unconnected lines or may be connected in a spider web or cluster pattern. Spider veins can cover a large area of skin and be quite unattractive. They are most common on the thighs, ankles and feet. The procedure involves micro injection of a TGA approved solution into unwanted veins. The solution acts on the inner lining of the vein, causing it to collapse and shrink so no more blood can flow through. Following the injection, the leg is wrapped firmly in a compression bandage which helps the lining of the collapsed vein to stick together. Patients are advised to walk following the procedure, which forces the blood to flow through other healthy blood vessels nearby. This is a simple procedure to reveal your younger, smoother looking legs. Spider veins on the legs are small lace like blood vessels (0.5 and 1mm in size) on the surface of the skin that may be red or blue in colour. Veins carry deoxygenated blood back to our heart. In our legs, blood is collected in the superficial veins, just below the skin surface, and delivered to deeper veins that run within our calf muscles. The muscular action of our calves and the one way valves inside the veins help to pump the blood against the force of gravity towards the heart. If these valves fail, blood pools in the superficial veins and enlarges them. Spider veins are also influenced by obesity, heredity, pregnancy and menopause. A micro-injection of a medicated solution goes into the unwanted vein, causing it to close up and shrink so no more blood can flow through. Within weeks, the unused vein is absorbed by the body and eventually becomes less noticeable. Generally, normal activities can be resumed after sclerotherapy. Clients are advised to wear compression stockings for 2 weeks after their treatment. Generally, normal activities can be resumed after sclerotherapy. Compression stockings and no vigorous exercise for 2 weeks after treatment are recommended. The treatment is not painful but individual micro injections can cause a mild stinging or burning sensation. 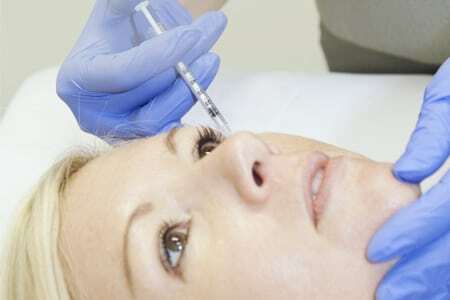 Some patients report that the solution we use at Dermedica Perth Cosmetic Clinic is less painful compared with solutions they have experienced in other clinics. The degree of improvement depends on the severity of the spider veins. The fading process is gradual and may take a few months. As with all medical procedures, individual experiences differ. It is important to have a thorough discussion with an experienced cosmetic doctor to assess if you are suitable for sclerotherapy. Contact Dr Teh on [email protected] or call 92051995 for an assessment. Brown spots. This is probably due to blood escaping at the time of injection into the vein. In most cases, the small mark disappears within 6 months to a year. Bruising. This is usually very small and disappears within 1-2 weeks. Small swelling/welt of the injected site. This usually disappears within a few days. Development of groups of fine red blood vessels. The new appearance of previously unnoticed fine red veins can occur after sclerotherapy. These new very fine veins can occur after 2-3 days or may not be visible for several weeks following treatment. Usually the condition improves in a few months without any specific treatment. Small ulcers at injection sites.Very rarely, a small ulcer may occur over the injected vein. The ulcer can be successfully treated but it is necessary to inform the treating doctor as soon as possible. Inflammation of treated veins. Very rarely, the injected veins become inflamed. When this occurs it can be treated with anti-inflammatory medication. Allergic reaction to the solution. Extremely rare allergic reactions may occur with any sclerosing solution. Minor reaction can be treated with anti-histamine medication. Deep vein thrombosis. Very rarely, deep vein thrombosis may develop after the treatment. The chances of developing deep vein thrombosis are about 1 in every 7000 legs treated. *As with all medical procedures, there are potential risks and side effects. It is important to have a thorough discussion with an experienced cosmetic doctor to assess your risks and side effects. The majority of people will see results in a few months. The result is long lasting, however due to the nature of your skin you may develop new veins over time. As with all medical procedures, individual results vary. It is important to have a thorough discussion with an experienced cosmetic doctor to assess your suitability for sclerotherapy. Contact Dr Teh at [email protected] or call 92051995 for more information. The treatment duration depends on the surface area which requires attention. Most people will require a few treatments, depending on type, distribution and severity of the leg veins. There are individual variations to the number of treatments required. Dr. Joanna Teh at the Dermedica Cosmetic Medical Clinic in Perth are highly trained and have many years of experience in administering sclerotherapy. Our priority is on delivering visible results with uncompromising care, service and respect. We welcome your enquiries and will be glad to assist in any way to improve your appearance.